Noble Mission is indeed on a mission in the Champion Stakes, the feature race on the £4m Qipco British Champions Day at Ascot. The younger brother of Flat racing's all-time great Frankel - himself twice a star of Britain's richest raceday - can lift an only okay season for his trainer Jane Cecil into something considerably more spectacular on Saturday. And having been moulded in his early years, just as Frankel was throughout his unbeaten career, by Lady Cecil's iconic late husband Sir Henry, the sport would consider it a noble mission indeed. The good-looking five-year-old, owned by the stable's principal patron, Saudi Prince Khalid Abdullah, has been better than ever this season, revelling in front-running tactics under jockey James Doyle. Two first prizes at Group One level - one achieved in Ireland and the other in France, courtesy of the dope-test demotion of the narrow first-past-the-post Spiritjim - bestow on him standard-bearer status for the Cecil team. His - and Frankel's - little sister Joyeuse has done well, too, but otherwise the form of the 50-strong string at the historic Warren Place stables has been patchy enough for some to question its future. There's nothing like a domestic Group One win, however, and that's what Noble Mission, who'll relish the rain-softened Ascot going, is after as he lines up as a leading contender in the Champion Stakes. Lady Cecil does not dispute that times have been hard, but she insists she has no regrets about taking over the reins when her husband died in 2013. Speaking on the Newmarket Heath gallops, she said: "Can you imagine being out here like this? Especially in the beginning it was a way of... I know it's not a reason to do anything, but it was a way of staying close to Henry. "If it all had to just finish, that would have been more difficult, to give up. "You're in a place like Warren Place; it's one of the best places to train from. I've got great staff and wonderful owners: who wouldn't want to do that? "I obviously don't have the numbers of some of the Newmarket trainers, but I think we've done well with what we've got - we've won two Group Ones, two Group Threes, and a listed race. "One of the things I really, really wanted to achieve was Group One, and how likely did it seem last year?" As for the future, Lady Cecil - whose husband was champion trainer 10 times but also endured notable racing lows - described herself as "quite a determined person", looking forward keenly to 2015. More immediately, she's concentrating on Noble Mission's tilt at the £1.3m Champion Stakes. Amongst others, the horse is due to face French champion Cirrus Des Aigles, a former winner and two-time runner-up (once behind Frankel), and Irish raiders Free Eagle and Ruler Of The World, the 2013 Derby winner. With a confirmed mud-lover to saddle, there's been no gloomy wringing of hands at Warren Place over the quantity of rain that's been falling at Ascot, causing a string of non-runners. The trainer said: "We know he likes soft ground - it's just a shame Cirrus does too. But obviously it's going to make it a harder decision for some of the other trainers whose horses haven't gone on that ground. "You hardly dare dream but so far we are getting the ground, he's in great form and I know he's had a long break [since his previous run, in July] but he's done well for it. "The race can't come quick enough really. You worry about them stepping on a stone or getting an abscess in their foot but, like Frankel, he's a really sound horse and has never given us a day's concern. "It's a mixture of nerves and excitement, and to have a horse to run on Champions Day feels like a real privilege." The race is likely to be Noble Mission's last hurrah before stud duties beckon, as it was for Frankel when he made it 14 wins from 14 career starts in the 2012 staging. Sadly, that was also the last public sighting for many of Sir Henry Cecil before his brave struggle against cancer was lost. Success two years on really would be poignant for all concerned. 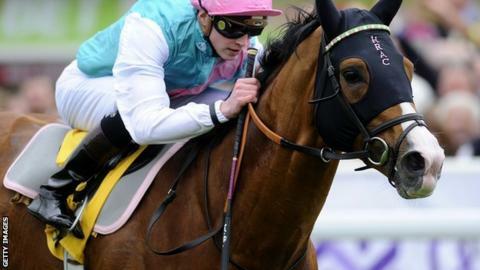 The Champion Stakes (16:05 BST) will be centrepiece of coverage from Champions Day on BBC Radio 5 Live on Saturday.